In my book, Ultimate Leadership: 10 Rules For Success, Rule Number 1 is “never allow your emotions to dictate your actions”. And I learned this rule the hard way because I allowed my emotions to dictate my actions. This affected my leadership credibility, my reputation, for almost a decade until I was able to get out from under that cloud. So when we think about the importance of leading with emotional intelligence in our job. It’s one of the skills that leaders maybe don’t always put into their leadership toolbox. Well, today we’re going to talk about leading with emotional intelligence and the importance of that skill to successful leadership. 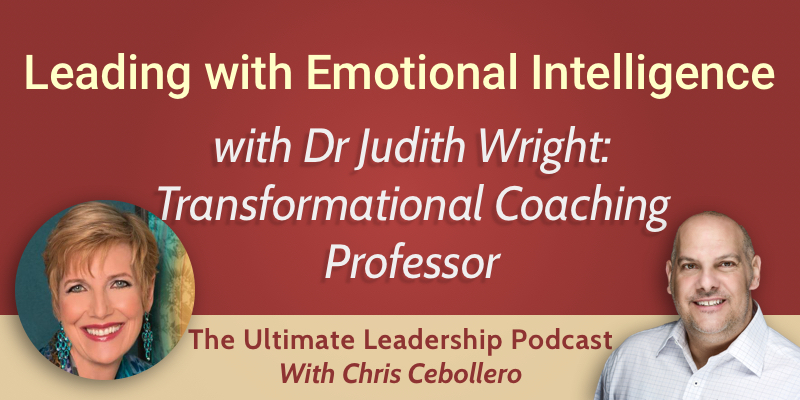 Dr. Judith Wright is Professor of Transformational Coaching and co-founder and Chief Academic Officer of the Wright Graduate University for the Realization of Human Potential. A media favorite, Judith’s work has been covered in over 1,000 media appearances, including ABC’s 20/20, Oprah, Good Morning America, the Today show, radio and television shows around the country, and magazines and newspapers around the world. This episode is packed with insight, so I hope you enjoy. How important is it for a leader to have a high degree of emotional intelligence (EQ) when leading their workforce? How does emotional intelligence affect productivity? When it comes to EQ, what is the biggest misconception leaders have? Is there any relationship between EQ, and having a foundation of Servant leadership? How important is self-awareness to your leadership success? If you have allowed emotions to dictate your actions, how do you heal the problems with your workforce that result? Where to learn more about Dr Wright and the work she does? EQ is critical. It’s actually one of the most important factors in a leader’s success. The ability to have your followers trust you, to be able to lead with inspiration, your ability to build rapport, to build loyalty, even productivity, are all tied directly to your EQ. The more complex your job is, the more important emotional intelligence is. And as leaders, we have the most complex jobs in our companies. It seems counter-intuitive because we assume that our emotions get in the way of productivity – that we have to control them in order to be productive. However, the studies show the opposite. They show that productivity can be up to 127% higher with those that have a high level of emotional intelligence. Particularly for complex jobs. This is because you can be more in touch with what is going on around you, you can be clearer, more present, and have the wisdom of your emotions rather than allowing them to control you. So they are not something to suppress. Your emotions provide you with situational wisdom to guide you to take clear and decisive actions. The biggest misconception is that we should suppress our emotions. That to be stoic or unemotional is a greater strength. We shouldn’t be hysterical or lose control of our emotions, but they are extremely important to rational thinking and for decision making. We need that access to our emotions to know what we are feeling in the moment and interpret and understand what they mean within a given situation to guide our actions. Being in touch with your emotions allows you to express passion which translates to the workforce. Suppressing feelings diminishes our cognitive resources in our frontal lobe or prefrontal cortex – the kinds of things we need to be able to be present and be a good leader. To be able to understand and label our emotions, it brings our frontal lobe online to be able to process that emotion, find its meaning and deal with it appropriately – whether that be in a meeting or with a member of your team etc. This creates an authentic front that allows you to have a much more successful and open relationship with your workforce. Is there a separation, emotionally, between those that lead from a position of authority versus those that practice a Servant leadership style? There is a connection between EQ and Servant leadership. In Servant leadership you care about your people, you are invested in them, you are aware of their needs and are helping them to develop. You need emotional intelligence to be able to do that. EQ is the foundation of social intelligence – which is to be able to read other people and have empathy and understanding for them. You need EQ in order to be able to make that contact and care about your people and inspire and support them through their development. Leadership can be defined, says Dr Wright, as the ability to touch the thoughts, feelings, and behaviours of another human being. We don’t need a position to do that, we need to be able to be emotionally aware and emotionally present. If we can connect to our own hearts, we can connect with other people’s hearts and minds. It’s critical, says Dr Wright. When a leader comes to her with a problem, concern, or challenge. The issue is their developmental challenges inside of them rather than a particular leadership skill they must develop. The more aware we are of who we are, what we’re thinking, and what our behavioural patterns are, the more we can choose appropriate ways to deal with challenges in front of us. We can’t be aware of other people without first being aware of ourselves. IN: The ability to really feel. To know what’s going on inside of us, read our bodily cues (for example a pounding heart, a knot in our throat, etc. ), and interpret them appropriately. OUT: The ability to express that feeling fully, responsibly, and authentically. And to be able to complete the emotion to move onto the next thing. UP: To be able to regulate emotion. To be able to intensify and savour positive experiences. DOWN: Being able to sooth, calm ourselves, and contain our feelings – not suppress those feelings, but comfort ourselves and be able to deal with a given situation. To be able to take our emotions IN and understand and label the core feeling we are experiencing in a given situation allows us to be present to them and also to use the higher faculties of our frontal lobe to be able to sort through the best way to deal with them. It’s a part of being human. We will make mistakes in our leadership. Can we clean them up and take responsibility for them? Can we admit that we messed up and repair the relationships with our followers? It’s not our emotions that are at fault here, it is our ability to deal with those emotions. But to be able to authentically connect with people about your emotions and be vulnerable, you can tell a deeper truth about what is going on within ourselves and repair any damage that takes place. Or: http://wrightfoundation.org/ – where you can find about the graduate university, coaching, consulting and more.